Last Friday my friend, Hannah, came to the Look, Cook, and Eat kitchen to teach me and our Facebook friends about adaptive cooking tools (you can check out the Facebook Live piece we did here). 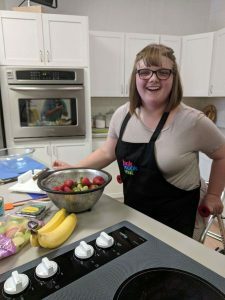 Hannah has cerebral palsy and uses a walker to help get around, so the adaptive tools for the kitchen are sort of like the walker – they help her get around in the kitchen, so to speak. I take for granted that typical kitchen utensils and gadgets can be hard to use for many people. Sometimes certain conditions, like cerebral palsy and arthritis, can make gripping or controlling muscle movement in the hands and arms difficult. But Hannah showed me that, with the help of a few adaptive tools, she can be independent in the kitchen – and take it from me, she knows how to cook! Hannah won the LCE cooking competition at the Iowa State Fair last summer! Really, some of these tools are so helpful, I can totally see them being used in any kitchen, not just the kitchens of people whose hands and arms work differently than mine. Hannah uses this thin sheet of sticky plastic to keep cutting boards and mixing bowls in place on the countertop. It’s durable, very lightweight, portable, and convenient. Hannah’s mom, Shannon, said that it’s also great for opening jars and bottles – I love that tip! Just put the mat on the lid of the jar and twist. The sticky mat helps you grip the lid more tightly. My hands don’t grip so tightly anymore and sometimes it’s really hard for me to open pickle and olive jars. Dycem plastic mat to the rescue! Now, the plastic is a little expensive (buy it here on Amazon), but there are lots of options when it comes to size and length. Plus, it comes in a roll so you can cut it to size. If you need a quick solution to keeping a cutting board in place and don’t have Dycem, get a couple of paper towels or a kitchen towel damp and put the cutting board on top. I’ve also used shelf liner, although it’s not quite as sticky as Dycem. This nifty little board allows you to cut things with just one hand! How, you ask? Well, do you see those two nails sticking up? Just poke whatever it is you’re cutting onto the nails (we used bananas, apples, and strawberries) – they’ll hold onto the food so you don’t have to! – then use your knife to cut the food into pieces. So slick! The “walls” on the opposite corner of the board help keep whatever you’ve cut up from rolling around and getting in your way as you slice and dice. This board has suction cups on the bottom so it stays put pretty well without anything underneath, but you can see the blue piece of Dycem that Hannah brought in underneath the board in the photo above. Here’s a neat knife which allows Hannah to cut pretty much anything, especially if it’s secured firmly on the nails of the Single-Handed Cutting Board. I was impressed with how sharp the knife was, and Shannon said that it’s even good for cutting pizza! 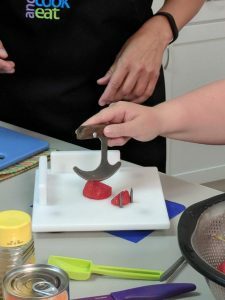 The curved blade allows the user to “rock” it back and forth to chop – Hannah said that she doesn’t have to “saw” back and forth, which requires a little more muscle control in the arm and hand. She also brought a regular knife from her mom’s kitchen (you can see it in the photo above for the cutting board) which she sometimes uses when the rocker knife doesn’t work as well. It was a short-bladed serrated knife (which means that the blade has little “teeth” that can help cut things like tomatoes and celery), and I think having a knife like that (in addition to the rocker knife) would be helpful for most people. I also use these plastic knives in cooking classes and they’re good for cutting most vegetables and fruits. The awesome thing about them is that they don’t cut your skin; the not-so-awesome thing about them is that things like chicken breast or steak are harder to cut. But they’re great for practicing and getting comfortable with the motions of cutting. These are just a few tools that are worth checking out if you’re looking to do a little more cooking and have some trouble with muscle control in your hands and arms. Do you have any special tools that you use in the kitchen? Or do you wish there was an easier way to tackle a common kitchen task? Tell us about them here! 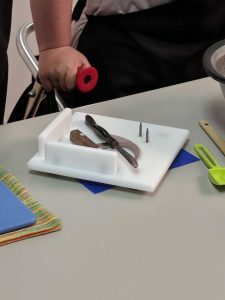 And stay tuned for more adaptive tool tips – we’re planning some fun stuff with Easter Seals Iowa later this summer around adaptive kitchen tools! A big thanks to Hannah and mom, Shannon, for showing us these great tools! We can’t wait to have her back in the LCE kitchen to cook some more!